While most of us struggle to balance on one foot, let alone our hands, Victor Chau makes it look effortless with his gravity-defying yoga poses set against amazing backdrops of the world (just check out his Instagram). Chiseled, tan and always beaming (seriously, how? 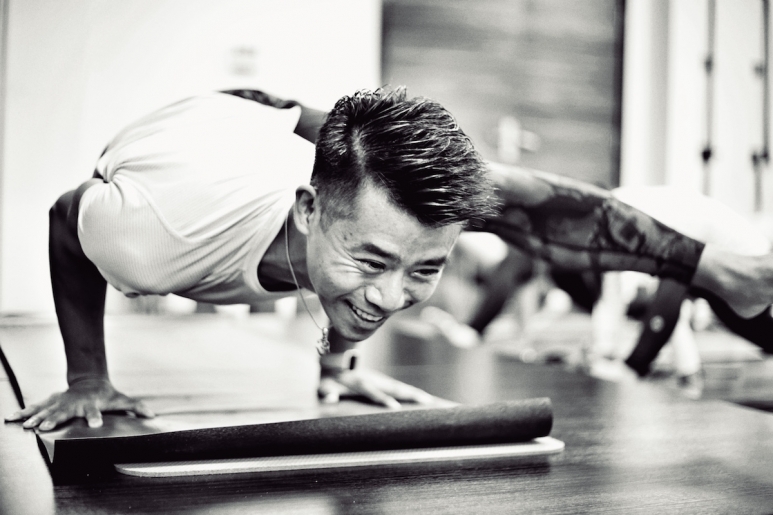 ), Victor is one of Hong Kong’s most popular yoga instructors thanks to his positive and playful teaching style. Proving that yoga isn’t just for women, the Lululemon and Boys of Yoga ambassador shares his advice for all the men out there who are (or aren’t) considering to pick up the practice. It was in 2001 right after a spin class. I can’t say it was love at first sight because I wasn’t very fit back then. Even though I didn’t like it, I decided to give yoga a second chance and thanks to a great teacher, I continued practicing and never looked back. Why should men do yoga? There’s a big misconception that yoga is for nimble women with supermodel figures. In fact, yoga used to be something that was passed down only among men in India. Both men and women should do yoga because it cultivates a sense of balance between yin and yang, flexibility and strength. When your mind and body are balanced, you achieve perfect health. What are the benefits of yoga, specifically for men? Improved flexibility is the most obvious benefit, particularly in the shoulders, hips and back. You also gain a lot of strength doing yoga (think of all the handstands, headstands and arm balances). Do you think men are too competitive for yoga? Men have been socially conditioned to be competitive Alpha males -- just look at sports like CrossFit, HIIT and the Spartan Race. But from my experience of teaching worldwide, both male and female Hong Kong yogis tend to be super competitive. My advice is to focus more on the journey (how to do a pose) rather than the pose itself. We learn so much more about ourselves when approaching a pose, rather than just achieving it mindlessly. What types of yoga are best suited for men? Different styles of yoga apply to men of different ages. For the young and energetic, start with Vinyasa, Power or Ashtanga yoga. For men who want a more gentle approach, try Hatha or Yin yoga. What classes would you recommend starting with? Whatever your level of fitness, start with a beginner’s class (of any style) to get familiar with the poses, sequence and technique. Be experimental and open minded. Ultimately, yoga is both a physical and spiritual practice, and you can make it as physical as you want. The key is to keep practicing and you will reap the benefits of yoga without even noticing it. What should men wear when practicing yoga? Lululemon has a great collection for men, while Grana’s Peruvian Pima T-shirts are great if you like cotton. For the design conscious, try The Upside for tops and 2XU for high performance compression tights (both available at Lane Crawford). How often should men do yoga? As often as they can! If yoga is your passion, then do it every day. If you already have a regular workout regime, add at least one or two yoga classes a week. Your workout, and ultimately your mental health, will improve tremendously when you introduce yoga to your life. 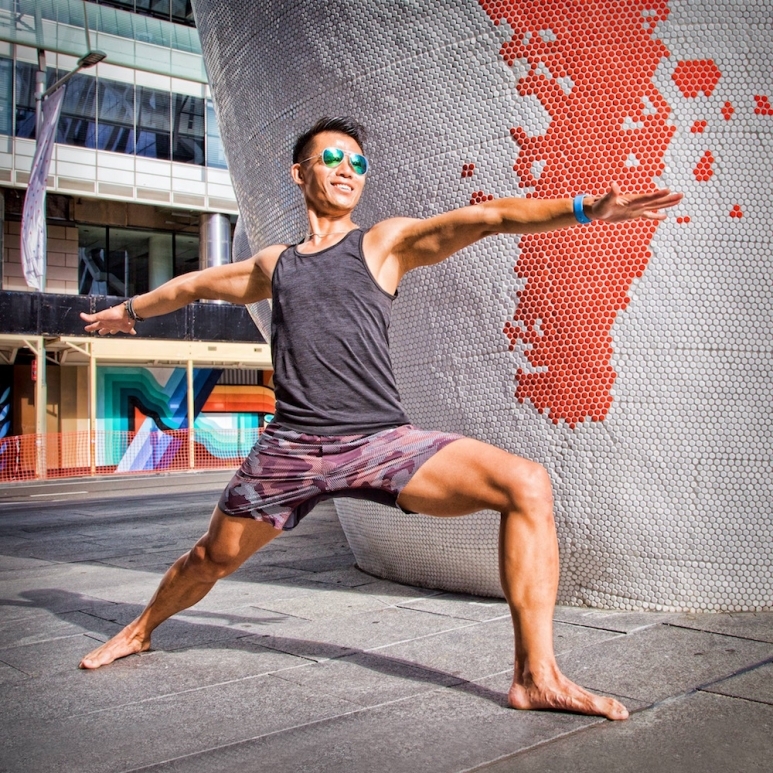 Follow Victor Chau (@victorchauyoga) and catch him at major yoga studios, events and festivals in Hong Kong.